The culmination of spring semester brought much-deserved awards for distinguished Reinhardt University faculty. Cindy Moss, lecturer of Business Administration in the McCamish School of Business, was selected for the Vulcan Teaching Excellence Award through the Georgia Independent College Association. Moss was recognized at the Honors Ceremony held at the James and Sis Brown Athletic Center on the campus of Reinhardt University. She said the Elizabeth Moss Bailey Faculty Mentor Award was surprising and meant a great deal to her because it is voted on by the students. The Vulcan Award, she said was an honor to receive and the $1,000 cash award came in at the right time, as she was able to use it to fund her trip to Puerto Rico to see her niece get married. “It was very well appreciated,” Moss said. Vulcan’s Southeast Division has sponsored the teaching excellence award since the early 1990s through the Georgia Foundation for Independent Colleges, Inc. The award is presented to a faculty member at each of the GFIC’s 25-member institutions, in recognition of outstanding contributions to undergraduate education, student learning, and campus life. Dr. Karen Owen received the 2016 Jane England Faculty Award for Excellence, named for the late history and political science professor Jane England. Owen was nominated by her peers and selected by a committee. Owen is the director of the Master of Public Administration program and assistant professor of public administration. She holds a Bachelor of Arts in political science and history, a Master of Public Administration and a Ph.D. in Political Science, all from The University of Georgia. Dr. Katherine Hyatt and Dr. Cory Schantz earned the Faculty Research/Scholarship Awards. Hyatt earned the award for a January 2016 journal article “Effectiveness and content of Corporate Codes of Ethics as a model for University Honor Codes,” published in the International Journal of Technology and Educational Marketing. Hyatt previously won the award in 2011 and 2014. “It was a surprise and an honor since many people at Reinhardt do a lot of great research,” said Hyatt, who recently was appointed as the Dean of the McCamish School of Business. Her appointment is effective July 1. The prestigious United Methodist Exemplary Teacher Award for 2016 was presented to Adetunji Adesesan. The award is funded by the Division of Higher Education of the General Board of Higher Education and Ministry of the United Methodist Church. 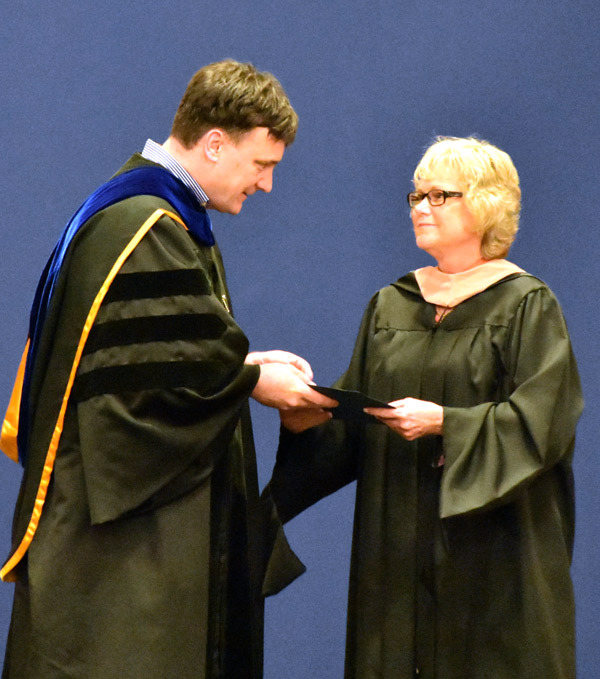 It is annually given annually to a Reinhardt faculty member to recognize excellence in teaching, commitment to value-centered education and service to students at the University.